On Facebook I mentioned that I made Masoor or Red Lentil Dal (Soup) and many of my friends wanted the recipe. I shared a recipe from the web there but I want to share my own simple home made recipe.So here it is for anyone who wants to try this delicious mildly spicy red lentil soup. In a pan heat the vegetable oil add the red chili (if you are using it) , chopped onions and garlic. Stir fry for 2minutes till they change colour . Add the red lentil /masoor dal and mix it well with the fried onion and garlic. Add 3 cups of water . Add turmeric powder and salt to taste. 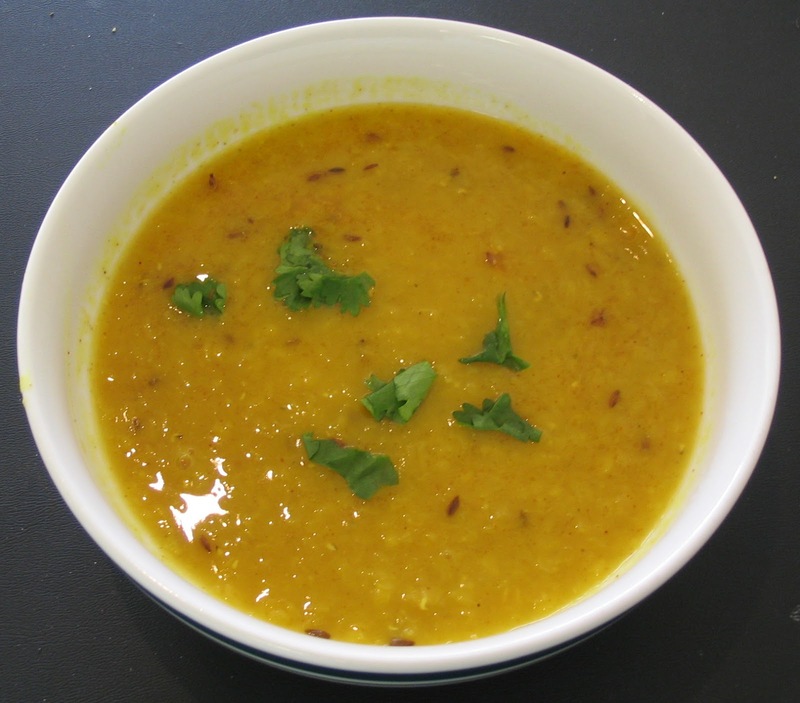 Cook dal on medium heat for 15 or 20 minutes until soft and well blended with the water. I cook my dal in a pressure cooker for 5 or 6 whistles. Garnish it with fresh cilantro leaves. Its ready to serve. You can eat it with plain white rice or chapatis or nan. Rice and dal is the popular lunch meal in India. It can be eaten with vegetables, poppadoms and salads. It looks good for cold days. This looks delicious Amrita. I wish I could find red lentils in my town. The next time I visit the city, I'm going to the supermarket and try to find them. Thank you for sharing your easy version of this delicious soup. I shall pick up some red lentils when in town. I still remember making one of your recipes a few years ago and the family LOVED it. Any gulab jamun on hand? Hi, Amrita- I haven't been on for a while, so I have missed a lot. This looks super yummy! Hi Kate , so glad you stopped by. Will come over see how you are doing.